I’ve been riding bicycles for a few decades now, but always in a passive sense. Last May 2016, someone convinced me to ride the NY 5 Boros Tour, a 40-mile ride around New York’s popular stomping grounds. I rented a road bike from a local bike shop, and the owner lets me ride his bike since he didn’t have any available in my size. This bike wasn’t anything I had ever ridden before and after riding it for 40 miles I was in love with the sport all over again. Fast forward August 2016 I was introduced to Team Velocipede by my good friend Saad where I joined other like-minded bicycle enthusiasts. I had already purchased a road bike back in May (After the tour) and had started riding almost regularly with my friends. I started learning about the correct way to ride the bike, the bike fit and how it relates to the body being in sync with the bike. I trained on a regular basis all of November and December getting ready for the first race that I’d compete in, well more like “participate in”. To prepare myself for the first race ever in any sport for that matter, required a lot of training which I lacked. I was psyched and terrified of what it’d require finishing just one lap. Training at home and riding around town I already knew that I was not going to be winning any podiums, but I was determined to participate and gain experience in riding with groups. It was more like chasing those groups. 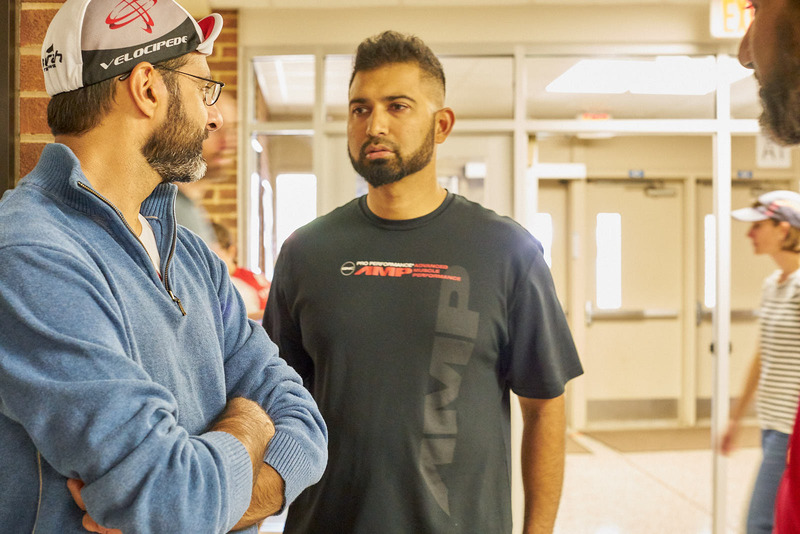 The race day arrived, I got all my gear ready and packed, met up with my buddy Saad and we drove down to Charlottesville a mere 2-hour drive from the comfort of our homes. Our race start time was set to 12:15 pm, we got there around 10:30 ish to check-in and pick up our race numbers. We then got back to the car and got ready for our warm-up laps, just to get the blood pumping and avoid any cramps on the race course. Even-though scared and terrified I just kept going along with the motions. The warm-up ride was about 20 minutes and we rode ~5 miles. 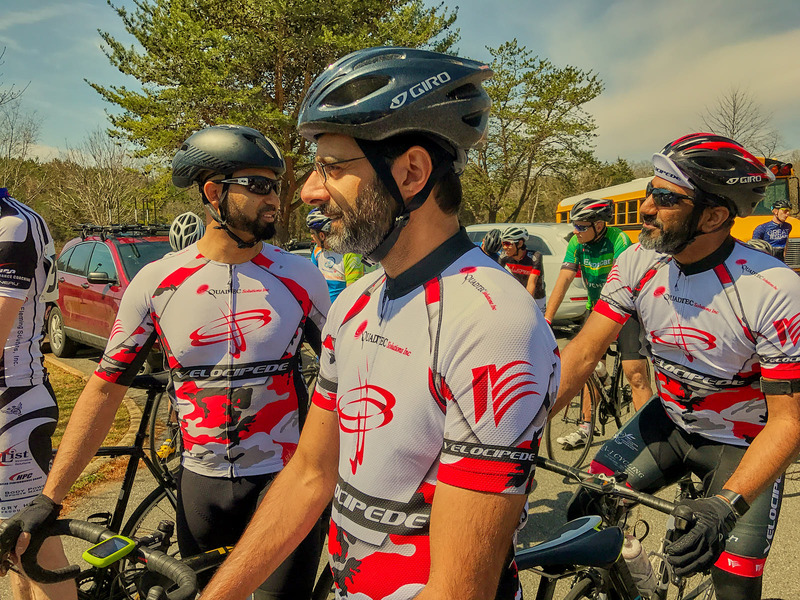 Came back to the staging area and met our teammates that competed in the early morning race for Cat-4, our “Qonductor” took 4th place in Cat-4 race and taking 1st place along with “The Goat” for Team Velocipede. We then lined up with our group of Cat-5 (almost 80 people were in this group, from ages 17-45) 45+ cat 5 had a different group. Our field of racers was followed by Women’s Category 1,2,3 and Women’s Category 4 & 5. The race was going to be a rolling start, where the group rolls up to the starting line and then take-off as the whistle is blown. The whistle blows and it’s all history in the making. I get my shoes clipped in and start pedaling. 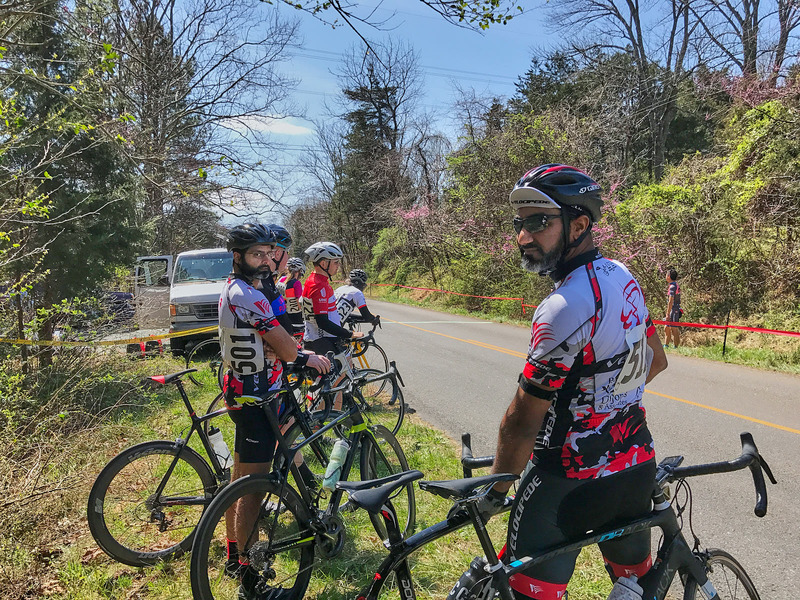 I tried very hard to stay with the group, but riders around me were much faster and better seasoned, I was left behind within the first couple of miles. The first climb just shows up in your face with a 1-6% grade, then a nice short downhill section and then another 5-6% grade for 1 mile. This had me pedaling as efficiently as I could. But I kept going, watching people on the side of the road cheering on to all the cyclists. I was passed by the group patrol bikes asking me to stay on the side of the road as women’s’ cat 1,2,3 had already started and were going to pass me, then women’s cat 4,5 patrol came and they too passed me. I wasn’t surprised, this was my first race but I kept going with my heart rate hanging around 175-178, I look long breaths and kept pedaling trying to bring that heart-rate down. Finally, I was on top of the hill. The night before I had watched the video of the course with commentary on what to expect and where the climb ends and the downhill section begins with lots of winding curves. I looked for those cues from the video and kept riding, enjoying the downhill section and trying to make the best time that I could. I kept rolling and pedaling to get to that lap marker. I’m approaching the lap marker I see an ambulance on the left, other support people and the race conductor called me out and asked me to end my race. As I passed the lap I saw my team mates waiting on the sidelines with their bikes as well, pull off of the race just like myself. It was a great first race experience, and yes I do wish that I had practiced more, but folks that partake in these races have been riding for a lot longer than myself and have stronger lungs, heart, and legs, not to mention probably a bit younger too. Amateur photographer and videographer, beginner cyclist.